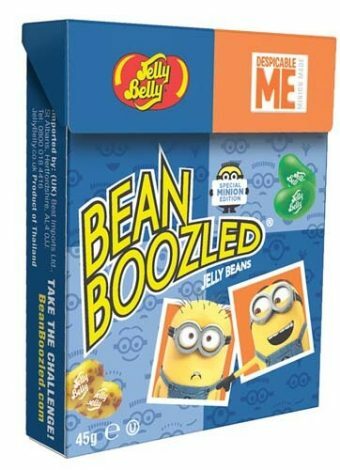 Jelly Belly Bean Boozled Minions Edition 45g Box. Inspired by Universal Pictures and Illumination’s DESPICABLE ME 3, BeanBoozled has been “Minionized” with a new mix of 10 delicious flavors (like Ba-na-na) paired along with 10 wild flavors (like Minion Fart). Intrepid jelly bean eaters will take their chances of tasting lookalike tasty or weird flavors. 1.6 oz Flip Top Boxes in two-24 count caddies.